...Then quickly put the egg on the top and wait. You should find that the egg is slowly sucked into the bottle. When you add the match or the hot water you cause the air inside to expand, this will push the egg up slightly and some air will escape. 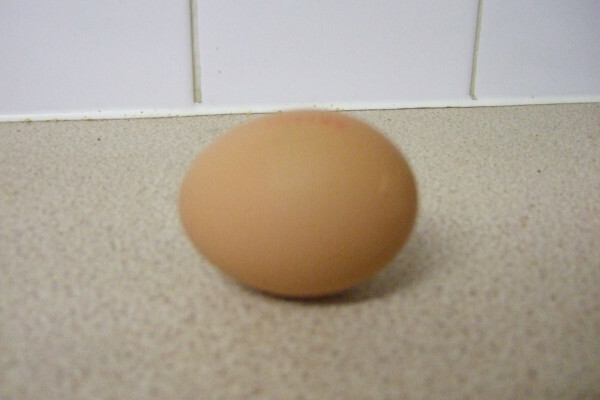 As the air then cools down again it starts to shrink, this pulls the egg down and forms a good seal. This means that the air pressure inside the bottle will reduce allowing the air pressure outside to push the egg into the bottle. And because a boiled egg is very rubbery and flexible you can get it into a bottle that has a neck far smaller than you would expect. When the match goes out the air shrinks reducing the pressure inside the bottle. How do I get the egg out again? Though there is always the simple mash it up and take it out in pieces option, there is a much more elegant and scientific strategy. Hold the bottle upside down so the egg falls over the neck, then blow into the bottle as hard as you can, the egg should then be pushed out by the higher pressure air inside the bottle, so you can still eat it for your tea. Blow air into the bottle around the egg. This raises the pressure inside the bottle which pushes the egg out again. How fat would you have to be to stop a bullet? What helps the egg to pull down into the bottle?? How does this experiment link to gas behaviour and gas laws?